Finding team building activities that will interest employees to spend time together can prove to be a daunting task. In a world where we spend more time with our co-workers than our families, teamwork activities are integral to gaining each other’s trust or just to have some fun while getting to know each other. For a variety of fun things to do in Mpumalanga that will bring your employees together, have a look at Komati Gorge Lodge’s activities below. Komati Gorge is a 4 Star Lodge. Have you been wondering how to bring your employees together in a fun and exciting way that will include everyone? Komati Gorge Lodge offers team building activities in Mpumalanga that gets the blood pumping and leaves a smile on all faces. Do you want to do something entirely different than the usual team building activities that usually bores all your employees? If a few of your employees have 4×4’s, you can take turns in driving the 4×4 trails and do some sight-seeing while you’re at it. While challenging each other on the tricky trails, your employees are sure to have a good time. Komati Gorge has a canoe, paddle boats and a raft at the lodge for our guest’s enjoyment. You can split the group up in teams of two and see which team can paddle upstream faster. The paddle boats are excellent for team building activities, as two members have to work together to reach a set destination. White Water Rafting is an exhilarating teamwork activity where a few members of the team also has to communicate constantly and work together to get safely from point A to point B. We would suggest however, that this group activity is not attempted when the river is running very fast, as this can be dangerous for first time rafters. For one of the even more exhilarating group activities for the thrill-seekers, you could all go for a few indoor rock climbing lessons and visit Komati gorge for the outdoor experience. This is surely the ultimate teamwork activity; the group can split into teams of two again and take turns in climbing and belaying. It must be one of the best ways to build trust. One of the most popular activities at our Lodge is the therapeutic activity of fly fishing! It can be challenging and tough to master, but even someone who has never held a fishing rod before will find satisfaction in learning how to fly fish. You could offer a reward for the employee that catches the most fish in a certain time frame. This group activity is ideal for a relaxing afternoon in the midst of nature. For the young and energetic employees, Komati Gorge Lodge has two marked hiking trails that would serve as an ideal activity for team building. While walking through the beautiful reserve, you could challenge your employees to finding wildlife and the one who sees a certain creature first will win a prize. Motivation is key when your aim is to challenge your employees. 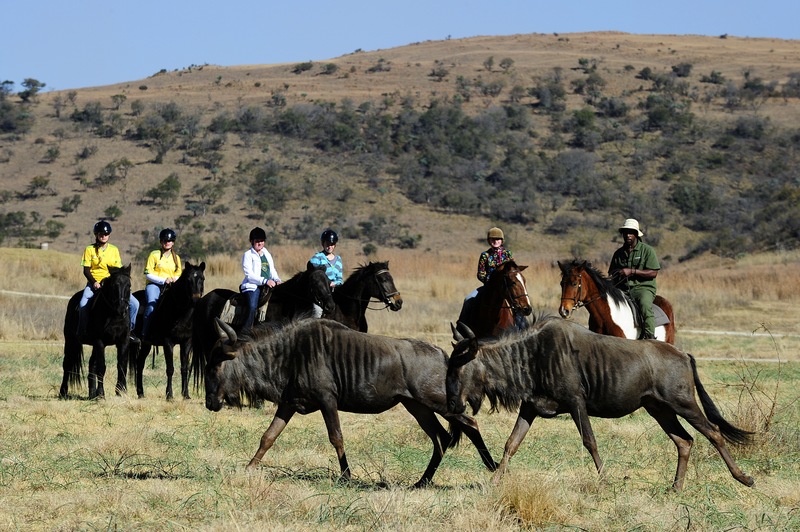 If your team is brave and not afraid of horses, we can offer a 30minute of 1.5hour trail through the reserve and you are bound to see some wild. Horse riding is relaxing and although it is not a very common team building activity, most employees would be thrilled to experience nature on horseback. It’s ideal to bring employees closer together with such a great memory. For something a bit more exhilarating, you could always opt for our quad biking adventure trial; we have guided tours of the reserve on quad bikes and we can guarantee lots of fun to be had whilst exploring the outdoors at Komati Gorge Lodge. Crossing streams and driving through muddy terrain is part of the package, but when you witness a herd of buffalo crossing mere meters away from you, it will surely be an experience you’ll never forget. Paintball is something that should be on everyone’s bucket list, whether you simply want to experience it once or become an avid paintball player, Komati Gorge Lodge can make your dream a reality. This teamwork activity can provide hours of fun; there are so many different paintball games to choose from, but for teambuilding purposes, capturing the flag would be ideal. Be sure to follow all the rules and regulations to ensure safety standards are upheld. For a team building activity that will challenge each employee to the max, you should try archery out for size. It requires great focus and practice, but every member of your team will surely enjoy the challenge involved in trying to hit that bullseye. It also falls under one of the more extreme team building activities, but if you follow the rules, it is extremely fun as well.